Successfully Added USB To HDMI Cable For iPhone and Samsung - 1080p Support, 88cm Lenght, Smooth And Fast Data Transfer, Plug And Play Design to your Shopping Cart. This USB to HDMI cable allows you to mirror all that’s happening on the display of your iPhone or Samsung smartphone onto your large screen TV. From now on you’ll be able to enjoy all your phone’s features on your television, allowing you to take the absolute most out of your smartphone’s capabilities. Play mobile games, browse the web, watch Full-HD movies, and enjoy the benefits offered by the latest mobile applications – with this phone USB to HDMI cable your options will be limitless. With its simple plug and play design, this USB to HDMI cable for phone allows you to easily connect your smartphone to your television. All you have to do is plug in the cable to your TV at the one end and your phone’s lightning cable at the other and you’ll be able to mirror all that’s happening on your phone’s display straight on to your TV screen. Perfect for sharing your holiday pictures with family after returning home, to watch your favorite movie on a big screen, or to simply browse the web and play mobile games like never before – with this HDMI to USB cable at hand you’ll be able to take the absolute most out of your iPhone and Samsung device. Compatible with all the major iPhone and Samsung models out there, this USB to HDMI cable for phone supports usage with the Samsung S7, S7 Edge, Note 5, S6 Edge Plus, as well as the iPhone 5, 5C, 5S, 6, 6 Plus, 6S, 6S Plus, 7, and 7 Plus. Supporting smooth and ultra-fast data transfer, this high-quality cable allows you to mirror all your phone’s features onto your big screen TV without experiencing any delay. 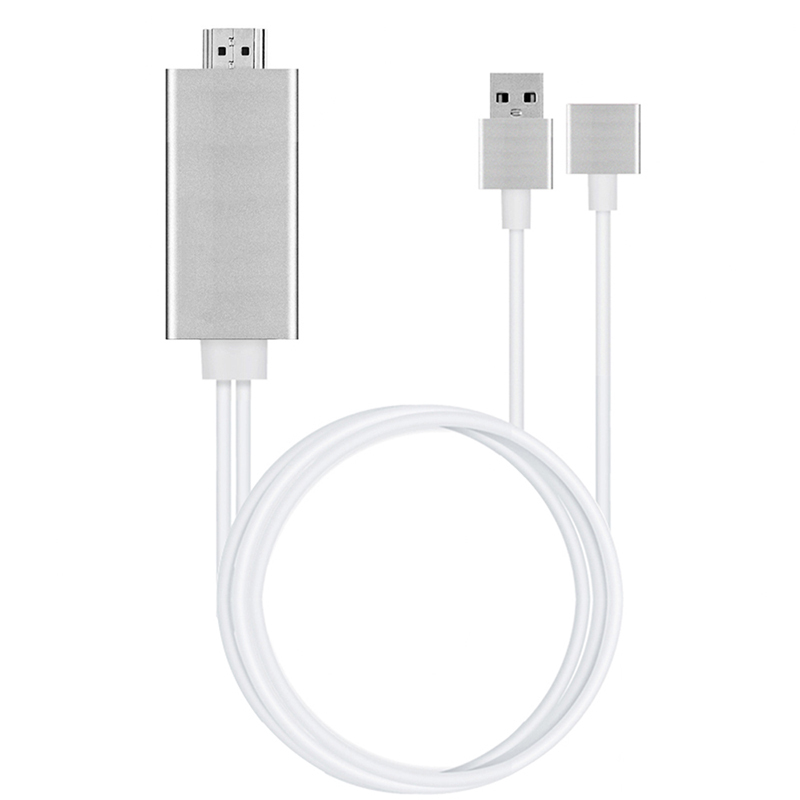 Unlike wireless data transfer methods such as Airplay and Miracast that experience occasional lag and interruption, this HDMI to USB cable for your phone allows you to smoothly transfer data without ever encountering any lag. From now on all the data and media stored on your Apple or Samsung smartphone can be easily carried around and displayed on a large screen TV at any given moment – allowing you to play games, watch movies, and browse the web on your television, giving you the impression as if you were using a state of the art smart TV. With this cable at hand, you’ll be able to take the absolute most out of your smartphone and television alike. This USB to HDMI cable comes with a 12 months warranty, brought to you by the leader in electronic devices as well as wholesale electronic gadgets..
Arabic: - الناقل التسلسلي العام كابل هدمي - Chinese Simplified: - USB 到 HDMI 电缆 - Czech: - HDMI kabel USB - Dutch: - USB naar HDMI-kabel - French: - USB vers HDMI Câble - German: - USB-zu-HDMI-Kabel - Hebrew: - USB כבל HDMI - Hindi: - HDMI केबल USB - Hungarian: - USB-HDMI kábel - Italian: - USB a HDMI - Japanese: - HDMI ケーブルへの USB - Korean: - HDMI 케이블을 USB - Malay: - USB untuk kabel HDMI - Norwegian Bokmål: - USB til HDMI-kabel - Romanian: - USB la cablul HDMI - Russian: - USB кабель HDMI - Thai: - USB กับสาย HDMI - Turkish: - HDMI kablosu USB - Vietnamese: - USB To HDMI Cable.